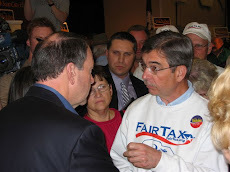 Barbara Panella has arranged for me to return to discuss the FairTax on radio station WRNJ 92.7 FM, 1510 AM, 104.7 FM. The program airs live this coming Thursday, March 31, from 10:05 to 10:30 AM. I will be joined by former Libertarian Party congressional candidate Jim Gawron so it should be fun. 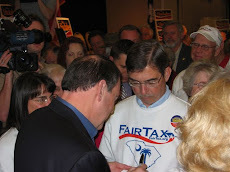 As readers of this blog know part of Mr. Gawron's platform was support of the FairTax - Jim is very well versed in the Austrian school of economics. Although the station is very popular in the local Hackettstown area it does not have a powerful signal outside the immediate area so it will be best to log on to http://www.wrnjradio.com to hear it over the internet. You may call in at (908) 852-1234. Naturally I will post it on ReturnToExcellence.net after the audio is available. You are a coward if you wont read Fairtax own fine print. HR section 2a, part 7, then section 102, section 703, parts a through c.
Thanks, Doug. I look forward to hearing you. I was at a mtg this morning at that time...will look forward to hearing it on the blog.